Ok, frugal boozehounds, here’s a tip from the Pixie…watch out for cranberries on sale at your grocery store between December and January: RIGHT NOW! Cranberries are tart, potent, and can be used to make many delicious things. Luckily for us, they are also full of antioxidants, vitamin C, and tannins! I was poking around in my freezer the other day and found one long lost bag of cranberries tucked in the back corner. I let them thaw overnight in the fridge, and started them as a cordial the following morning. Here’s how I made my spiced cranberry cordial, but feel free to play with the recipe, add things, and make it your own! 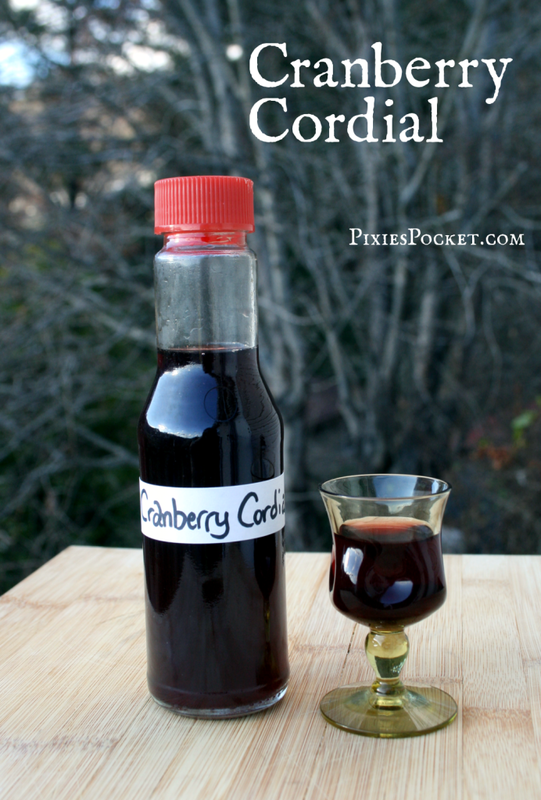 If you have never made a tincture, cordial, or elixir before, this post might be helpful to you. It is easy, I promise! 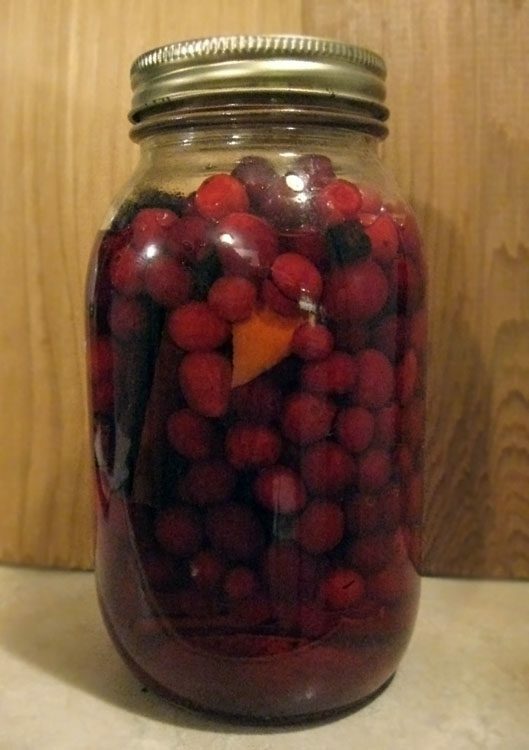 Now, this cranberry cordial recipe is quite malleable. More than an exact recipe, I’m sharing a technique with a few simple guidelines. The variations are endless. Add ginger root, star anise, black pepper, cloves, cinnamon, any other herbs or spices that you think might blend well with the tart, astringent cranberries. You can also play with the sugar syrup to change the end flavor of the cordial – white sugar makes a very neutral, highly sweet simple syrup, while brown sugar adds a depth of flavor from the molasses. A honey simple syrup is more cloying and rich but gives a great buffer to the tart berries. It is worth it to make this a few times, and try experimenting! Here are a few recipes for simple syrups to get you started. Wash and pick through the cranberries to ensure they are in good shape. Toss out any gross berries and put the good ones in a quart jar. Let them sit and thaw if they were frozen. Using a wooden spoon, mash the cranberries up. It might take some work, but it’s a good way to get rid of stress! Add a half cup of sugar, shake it up, and let it sit for a bit. The sugar will draw the moisture out from the cranberries. Add the cinnamon stick, anise, orange, and other spices into the jar. Cover it over with your booze of choice. Put a cap on the jar and label it with the date and ingredients. Stash the jar in a cabinet and wait for at least a week to let the flavors meld. I prefer leaving mine for a month or more! Strain the vodka from the jar through a muslin bag or cheesecloth, and don’t forget to mash the cranberries so you don’t miss a drop! Make a sugar syrup to add to the strained cranberry cordial and sweeten it to your taste. Label, bottle, and enjoy your delicious cordial throughout the year! Amber, did you do a redesign? It looks fabulous! So did the other one, of course, but this is slick! I have a question – we’re not drinkers, is there any other way to make this? Or something similar? Its look so yummy! Thanks, Tessa! I didn’t do a full redesign, but I am always tweaking the site here and there. 🙂 There is a new header, and the menu’s a bit cleaner (I hope!). Oh, I know! Maybe make a simple syrup out of cranberry juice/spices to store in the fridge to add to other beverages! Even if you do make it with alcohol, the sugar syrup that is added in dilutes it some, and you can always pour a bit here and there into fizzy water or soda to dilute it even further. Thanks for those suggestions! I’ll go check out that link right now…it’s a religious tenet so no fudging, but I love homemade syrups. Just around a pint…you lose some vodka to the fruit, and then replace it with sugar syrup to taste, so it evens out! Love love your post’s and thank you for a great source of info!!???? I was wondering if you have mad a cranberry and elderberry remedy?? Do u think it would be going over board?? I am so very Susceptible to getting sick, last year I made your elderberry remedy wonderful stuff. Does the orange peel need to be dried? Just wondering if fresh would work? ? Fresh would work, I’d do a whole fat slice of an orange though, since the aromatic oils are more concentrate in the dried version. I bet it will be delicious! <3 Cheers!